Is your vacuum cleaner losing pick up power or effective suction? Perhaps it simply cuts out or it suddenly stopped working. Maybe your clutch will no longer engage or you are getting a loud clunking noise from it? If you are hearing a loud "popping" noise, perhaps combined with some smoke or a burning smell - switch it off right away and get it to us! 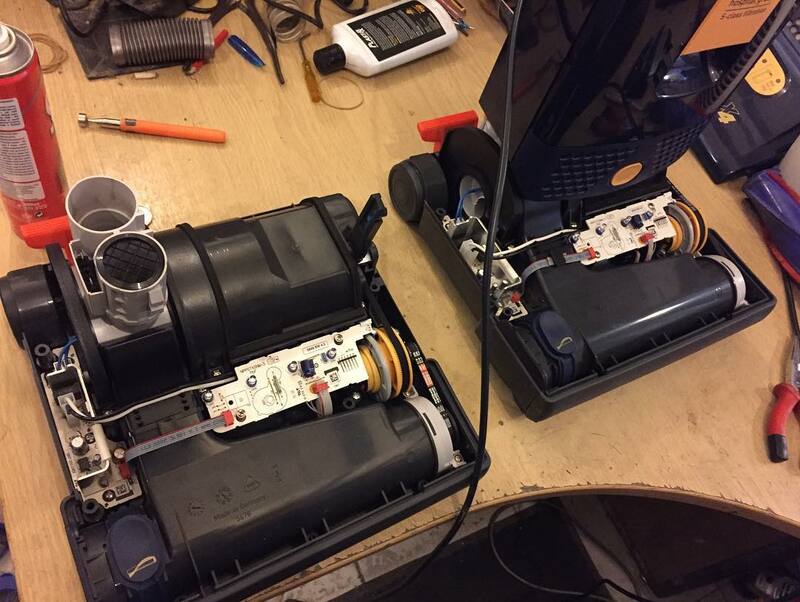 Whatever the problem with your vacuum cleaner, our specialist vacuum engineers can repair it. With our extensive knowledge of the whole Dyson and Sebo range, and our large stock of new and used parts, we can have your Dyson or Sebo up and running again in no time. Twenty five years experience in the vacuum cleaner repair business makes us your local Dyson experts. Perhaps you have recognised that it is time to give your Dyson or Sebo a service. If your machine is not as effective as it once was, or you have some concerns, it may be time to give it a service. For very small jobs such as blockages, etc., our minimum charge is just £18. We can often carry out small jobs while you wait. We offer a routine mechanical service for just £42 (Dyson will charge you an eye-watering £90+). This includes an electrical safety check, fresh filters, a partial strip down and examination, cleaning and unblocking all the airways, hot pressure cleaning the cyclone on certain models and checking all the seals, etc. You will get it back working like new. If you have heard in the media the claims from Dyson that “Dysons don’t need servicing”, this is inaccurate and utterly misleading and an explanatory article can be found on the Dyson Medic site >>here<< (opens in a new window). Need a new motor fitting to your DC01, DC02, DC03, DC04, DC05, DC07, DC08, DC14, DC19, DC24, DC25, DC33, DC41, DC50 or any other Dyson? We will fit you a brand new motor from just £65 with a one year warranty (and we'll even fully service it while we have it in bits). How long do repairs take? You will have your vacuum cleaner back again usually within a couple of days. For Dyson and Sebo repairs, we offer free, no obligation quotations. We will always advise you of the most economical course of action and seek your authorisation before any work is completed. No nasty surprises! We also underake fleet vacuum servicing for local councils, schools, hopsitals, etc. Dyson DC01, Dyson DC02, Dyson DC03, Dyson DC04, Dyson DC05, Dyson DC07, Dyson DC08, Dyson DC11, Dyson DC14, Dyson DC15, Dyson DC18, Dyson DC19, Dyson DC24, Dyson DC25, Dyson DC27, Dyson DC33, DC40, DC41.....Sebo X1, X4, BS36 Felix.... we can fix them all. Free loan of another Dyson or Sebo vacuum cleaner while yours is being repaired or serviced (subject to availability). We are the economical and green solution. In addition to new parts, we carry many used and reconditioned parts. We will fix your Dyson or Sebo in the most cost efficient way. 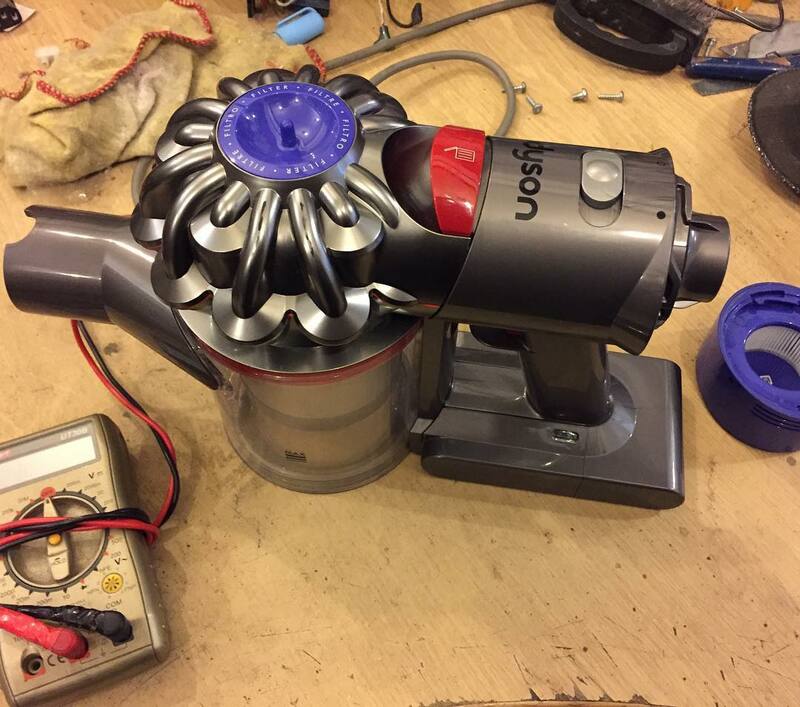 Even if you think your Dyson or Sebo is not repairable, let us take a look anyway. We may just surprise you, and it will cost you nothing to find out. A Dyson or Sebo is never dead at Manchester Vacs -- we can repair ANY of them! We can also repair Dyson Airblade hand dryers. We keep all spares in stock for AB01 and AB03 models. We also sell new and used Airblades. We dont exclusively repair Dyson and Sebo. We can also repair other brands of vacuum cleaner. We can repair Hoover, Henry, Numatic, Oreck, Bosch, Miele, Vax, Shark and most other brands. We are surprisingly easy to find. You can also park right outside and at the side! We are easlily accessible from the M60 (Denton island), just off the A57 Hyde Road. People come to us not only from our immediate locality, but from all over Manchester, Stockport, Cheshire, Tameside, Salford, Oldham, Rochdale, Lancashire, Glossop, Derbyshire and West Yorkshire. If you are travelling a long way, call us ahead and we will try to squeeze you in for a while-you-wait repair if it is a small job (We have a waiting area and a coffee machine). You can find a location map, Sat Nav instructions, directions, opening times, accepted payment methods, and all you need to know before you come >>here<<. No appointment necessary. Just check our opening days and times, and turn up with your broken machine when it suits you. We'll have a quick look at it, tell you the likely cost, take your number and give you a call when its done. A day or two is typical. What could be easier? Not local to Manchester, Tameside or Stockport? No specialist Dyson or Sebo repairers near you? No problem. If you are able to package your vacuum cleaner up, we can arrange courier collection from you (or you can use whoever you like to send it to us). We will repair your vacuum cleaner and send it back to you with DPD and you can pay us online. Carriage costs approximately £10 in each direction if we arrange it (a little more for those in the Scottish highlands or islands). For blown motors, you often need only send us the base unit (without the wand, back hose or cyclone). Please contact Claire at our shop for more information about this, and to tailor a plan to suit your particular machine, location and circumstances. The simple fact that we will cater to Dyson and Sebo owners in more outlying places has had many clients in the far flung corners of the UK and beyond describe us as "life savers". Although shipping costs a little more each way, we repair and service many Dyson machines from the far north Scottish Highlands, Guernsey, Jersey, Isle of Man, Orkney Islands, Hebrides, Isle of Arran, Isle of Wight, Isles of Scilly, Alderney and even Sark. We can ship to and from Northern Ireland, Eire, France, Spain, Portugal, Greece, Germany, Italy and Poland at reasonable rates too.